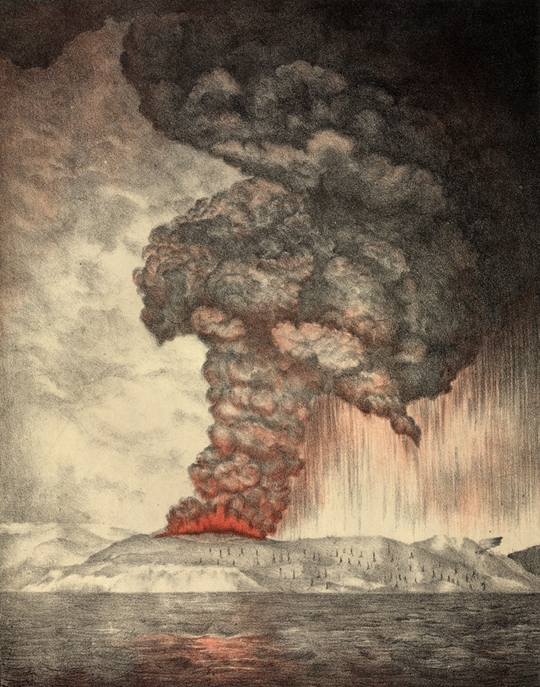 Lithograph from 1888 showing the Krakatoa eruption, author unknown. 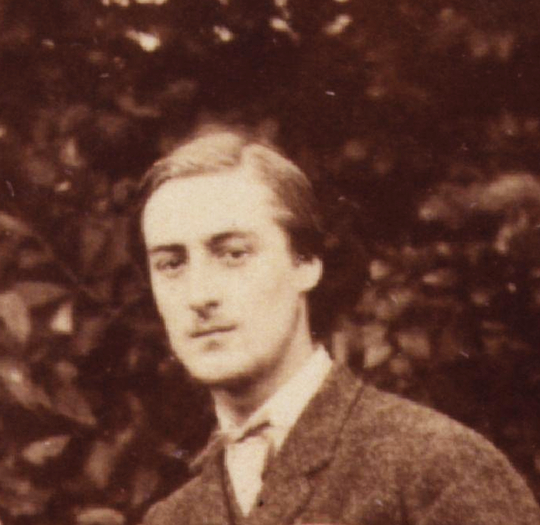 During the winter of 1883 the poet Gerard Manley Hopkins descended into one of his periodic depressions, “a wretched state of weakness and weariness, I can’t tell why,” he wrote, “always drowsy and incapable of reading or thinking to any effect.” It was partly boredom: Hopkins was ungainfully employed at a Catholic boarding school in Lancashire, where much of his time was spent steering his pupils through their university entrance exams. The thought that he was wasting his time and talents weighed heavily upon him during the long, brooding walks he took through the “sweet landscape” of Ribblesdale, “thy lovely dale”, as he described it in one of the handful of poems he managed to compose that winter. He was about to turn forty and felt trapped. Hopkins was a gifted empirical observer with a near-forensic interest in the search for written equivalents to the complexity of the natural world. Such interest in the language of precision was shared by many scientists at the time, science, like poetry, being an inherently descriptive enterprise. 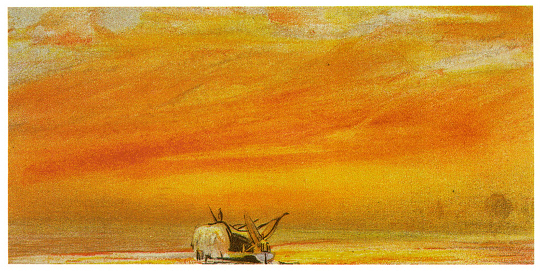 Anyone who reads the official Royal Society report on the Krakatoa sunsets (published in 1888) will find flights of poetic prose to rival those of Hopkins, who described such language as “the current language heightened and unlike itself,” a dynamic written form that was particularly suited to the expression of what he called “inscape”: the distinctive unity of all natural phenomena that gives everything in nature its characterising beauty and uniqueness. The force of being that holds these dynamic identities together he termed “instress”, instress being the essential energy that enables an observer to recognise the inscape of another being. These post-Romantic notions formed a kind of personal poetic creed, a logocentric natural theology that was rooted in the work of Duns Scotus, the medieval Christian philosopher. 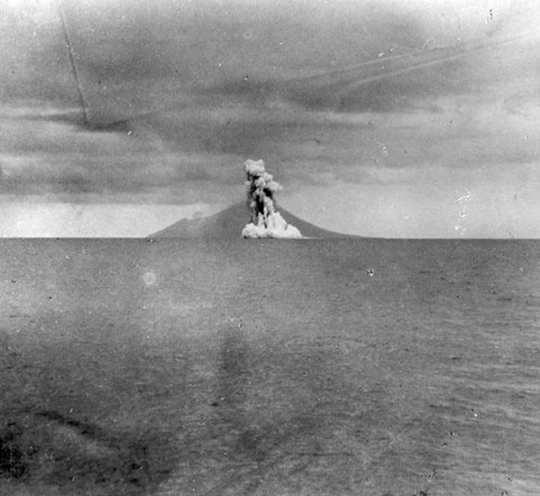 Photograph taken in 1928 of the destroyed Krakatoa island resurfacing, forming what is known now as 'Anak Krakatau', or 'Child of Krakatoa'. Tropenmuseum of the Royal Tropical Institute (KIT). For Hopkins, inscape and instress lay at the heart of his religious and poetic practice, as well as being vital means of apprehending the natural world. In a journal entry for 22 April 1871, for instance, he records “such a lovely damasking in the sky as today I never felt before. The blue was charged with simple instress, the higher, zenith sky earnest and frowning, lower more light and sweet.” Note that he felt the damasking as well as saw it, and note, too, his calibrated descriptions of the banded blues of the sky, the higher “earnest and frowning”, the lower “more light and sweet.” His journals are full of such poetic quantifications, which he used as notes towards a quintet of articles that he published in the journal Nature, all on meteorological subjects. 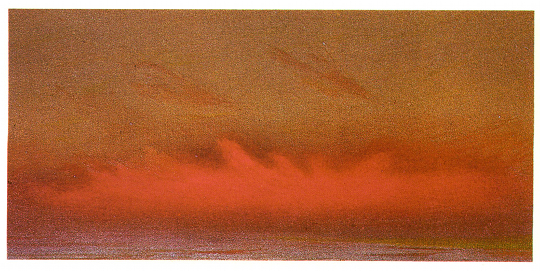 The first two, published in November 1882 and November 1883, were letters describing anti-crepuscular rays (cloud-shadows that appear in the evening sky opposite the sun), while the following three were all on the subject of the Krakatoa sunsets, which had evidently furnished the melancholy Hopkins with a much-needed source of distraction. For day by day, thro’ many a blood-red eve . . . Visual artists also found themselves extending their colour ranges in awed emulation of the skies. 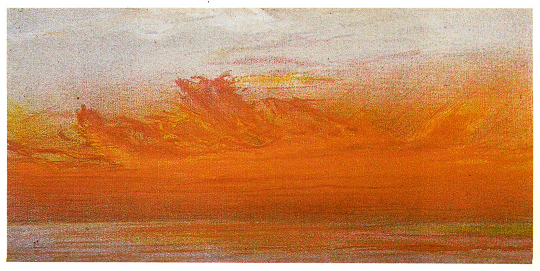 Painter William Ascroft spent many evenings making pastel sky-sketches from the banks of the Thames at Chelsea, noting his frustration that he “could only secure in a kind of chromatic shorthand the heart of the effect, as so much of the beauty of afterglow consisted in concentration.” He exhibited more than five hundred of these highly-coloured pastels in the galleries of the Science Museum, in the repository of which they remain to this day, little known and rarely seen. Three of the hundreds of sketches carried out by William Ascroft in the winter of 1883/4 - used as the frontispiece of The Eruption of Krakatoa, and Subsequent Phenomena: Report of the Krakatoa committee of the Royal Society (1888), ed. by G.J. Simmons. In Oslo, by contrast, the sunsets helped inspire one of the world’s best-known paintings: Edvard Munch was walking with some friends one evening as the sun descended through the haze: “it was as if a flaming sword of blood slashed open the vault of heaven,” he recalled; “the atmosphere turned to blood – with glaring tongues of fire – the hills became deep blue – the fjord shaded into cold blue – among the yellow and red colours – that garish blood-red – on the road – and the railing – my companions’ faces became yellow-white – I felt something like a great scream – and truly I heard a great scream.” His painting The Scream (1893), of which he made several versions, is an enduring (and much stolen) expressionist masterpiece, a vision of human desolation writhing beneath an apocalyptic sky, as “a great unending scream pierces through nature.” As it happens, the final eruption of Krakatoa on 27 August 1883 was the loudest sound ever recorded, travelling almost 5,000 km, and heard over nearly a tenth of the earth’s surface: a great scream indeed. As for Hopkins, the publication of his Krakatoa essay coincided with the welcome offer of a professorship in classics at University College Dublin. He left Lancashire for Ireland in February 1884, relieved to have made his escape. It didn’t last. Homesick, lonely and overworked, Hopkins succumbed to his worst depression yet, his misery traced in the so-called “terrible” sonnets of 1885 (“I wake and feel the fell of dark, not day”). He died of typhoid fever in June 1889 (aged 44), and was buried in an unmarked grave. Only his close friend Robert Bridges was aware of his greatness as a poet, and the bulk of his work remained unpublished until 1918. In fact, apart from a handful of minor poems that had appeared in obscure periodicals, the five Nature articles were the only works that Hopkins published in his lifetime. Richard Hamblyn’s books include The Invention of Clouds , which won the 2002 Los Angeles Times Book Prize and was shortlisted for the Samuel Johnson Prize; Terra: Tales of the Earth (2009), a study of natural disasters; and The Art of Science (2011), an anthology of readable science writing from the Babylonians to the Higgs Boson. He is a lecturer in creative writing at Birkbeck, University of London. Letters by Gerard Manley Hopkins in Nature, Vol XXIX, November 1883 to April 1884. Letter by Gerard Manley Hopkins in Nature, Vol XXVII, November 1882 to April 1883. The Eruption of Krakatoa, and Subsequent Phenomena: Report of the Krakatoa committee of the Royal Society (1888), Ed. by G.J. Simmons. The extracts featured in this anthology span centuries and continents, but are connected by their authors’ desire to understand, explain and enrich the world. The Art of Science is not a book about great scientific theories, complicated equations or grand old men and women in their laboratories; instead, it’s about the places we draw our inspiration from; about daily routines and sudden flashes of insight; about dedication, and – sometimes – desperation; and the small moments, questions, quests, clashes, doubts and delights that ultimately make us human. In her fascinating and beautifully illustrated book, Catherine Phillips, whose knowledge of Hopkins’s poems is second to none, uses letters, new archival material, and contemporary publications to reconstruct the visual world Hopkins knew between 1862 and 1889, and especially in the 1860s, with its illustrated journals, art exhibitions, Gothic architecture, photographic shows, and changing art criticism.